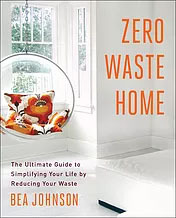 After I read the book Zero Waste home by Bea Johnson I thought, this woman is nuts. But the more I thought about it, the easier her life seemed. Zero Waste is a movement whose goal is for individuals to produce absolutely no waste. While even for Bea Johnson this goal has been elusive, as individuals we can all produce less waste. Here are a few things we have managed to do to help go from at least 10 13-gallon trash bag every week to about two every week. Most waste we produce is organic waste. Since our municipality doesn’t have compost collection, we have a compost unit in our yard. We can put uncooked food waste in it but we cannot put chicken bones, fats, fish, or other cooked food in it. I leave a small compost unit on our counter and take it out side as needed. I add yard waste to it and some paper. 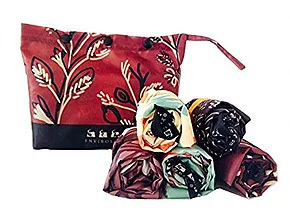 I use nylon bags for groceries, and mesh or muslin bags for produce and bulk items. I wash them with my regular wash after use. For lunches, we use lunch bags and reusable sandwich bags. This saves money since I am not always buying Ziploc® bags, and because I don’t waste time shopping for them. Instead of paper towels, I have a drawer full of rags that we use for everything. After we use them, we put them in a dedicated bin and wash them once a week. You may say washing wastes water, but grey water gets recycled and paper towels don’t. purchasing large quantities at one time. This reduces packaging waste in my home. While these items still need packaging, it is more efficient than individual sized items and hopefully the retailer recycles the packaging from the supplier. We stopped using paper and plastic utensils. I use them infrequently, for holidays, and I buy the compostable ones. How hard is it to load the dishes you already have into the dishwasher? It teaches my kids to pitch in more by helping to load and unload the dishwasher. We still have a way to go, but it is a journey and we haven’t reached our destination just yet. Tell me what you have done to reduce your waste or what you would like to do and let me know if you need tips to get you there.